The best cocktails in Nottingham! Join us at the Esquina Bar and enjoy a range of delectable cocktails – made with the freshest ingredients by our expert mixologists. The ideal venue for drinks with friends, an aperitif, or to unwind at the end of the evening. Our featured cocktails are a specially selected mix of old and new, with something for everyone. Also enjoy two-for-one on all cocktails, every day between 4pm and 8pm. The Espresso Martini is a fabulous mix of vodka, espresso and coffee liqueur. It’s rich, sumptuous and creamy, and the shot of espresso keeps you on your toes! 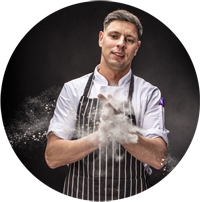 Well versed in signature specials, but equally comfortable with simple, straightforward dishes, Senior Sous Chef Raf Panek brings a wealth of knowledge – and delicious recipes – to Alea Nottingham.